North Korea is marking today the 101st anniversary of the birth of country’s founding father Kim Il-sung as tensions continue in the Korean peninsula. Kim Jong-un, Kim Il-sung’s grandson, visited the mausoleum of his grandfather and his father Kim Jong-il in Pyongyang, the official KCNA news agency reports. In recent weeks North Korea has threatened to attack South Korea, Japan and US bases in the region. The US has ruled out holding any more “artificial talks” with North Korea. US Secretary of State John Kerry said North Korea’s main diplomatic ally, China, had made a very strong statement criticizing Pyongyang for its recent behavior. He said he hoped Beijing was now recognizing the regional instability created by the actions of Kim Jong-un. Early on Monday Kim Jong-un was at the Kumsusan mausoleum to pay “high tribute and humblest reverence” to the country’s former leaders, KCNA reports. The streets of Pyongyang are adorned with flags and banners for the holiday, a red-letter day for one of the world’s most powerful cults of personality. Tensions have been high on the Korean peninsula after North Korea conducted its third underground nuclear test on February 12 that resulted in sanctions from the UN. 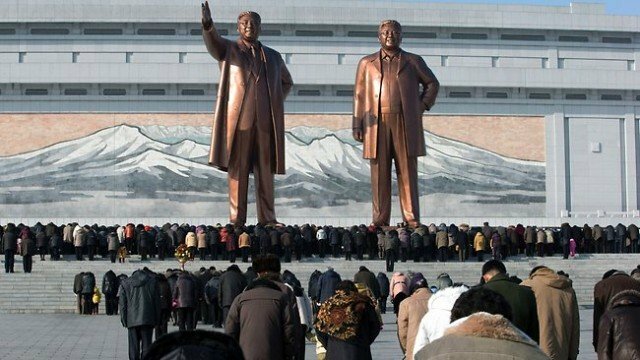 There is speculation that North Korea will use Kim Il-sung’s birthday for a missile launch. At this time last year, North Korea launched a rocket with the stated aim of putting a satellite into orbit to mark the 100th anniversary of Kim Il-sung’s birth. The rocket broke up shortly after take-off. The UN Security Council condemned the launch, which many outside the country saw as an illegal test of long-range missile technology. On Sunday US Secretary of State John Kerry called on North Korea’s leaders to “come to the table in a responsible way” to end regional tensions, warning it risked further isolation if its threats continued. He also reaffirmed the US commitment to defend its allies, including Japan. Speculation has been building that North Korea is preparing a missile launch, following reports that it has moved at least two Musudan ballistic missiles to its east coast.